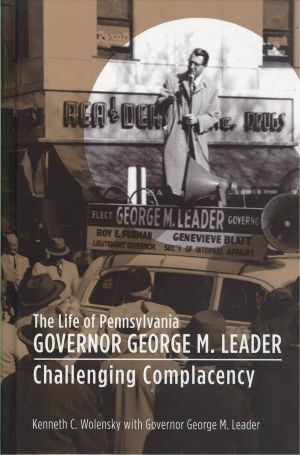 The Life of Pennsylvania Governor George M. Leader tells the story of George Michael Leader who, at 36, was the second youngest governor ever elected to the office and served from 1955 to 1959. His chances of being elected were tenuous at best: Democrats never fared well in pursuit of the Governor's Office in the Keystone State. His election was an upset. Republican Party stalwarts were stunned at the tally in Leader's favor. And, his election ushered in an era when the Commonwealth's electorate shifted its allegiance from majority Republican to majority Democrat, a trend that continues in the 21st century. Leader's administration achieved landmark legislation for economic development, civil rights, education for disabled children, mental health care reform, the environment, expansion of civil service, professionalization of government and in many other areas. Some referred to Leader as a refreshing change to politics-as-usual in the State Capitol. His opposition referred to him as "that stubborn young governor." Leader was proud of both monikers. George Leader dates to an era when politics were quite different. Handshakes secured votes, campaign budgets were small, modern mass media was in its infancy, personal attacks were few and political patronage was rampant at all levels of government. Challenging Complacency stands as the only oral history-based account of a Pennsylvania governor. Written by a leading Pennsylvania historian while the former governor was in his 9th decade of life, here Governor Leader tells his remarkable story.